Turner caused a frenzy back in 1993 when she revealed the method of creating the now beloved Blue Peter Tracy Island model, using little more than some toilet rolls and a reserve of papier-mache. 90s Blue Peter presenter, Anthea Turner has joined Vivid to celebrate the 50th anniversary of the pop-culture classic Thunderbirds this week. 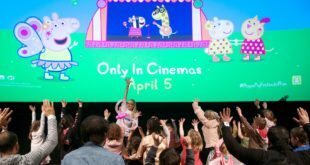 Today, the model has made its return as the television presenter joins master toy partner for the 2015 revamped Thunderbirds Are Go series, Vivid, to celebrate half a century of the hit series. When Turner’s model first made its appearance, Blue Peter was inundated with requests for an instruction leaflet, still available online. The most popular ‘how-to’ guide in Blue Peter history, Turner’s demonstration of how to build a replica Thunderbirds base garnered over 100,000 factsheet requests. But nostalgia aside and this year marks the third time Vivid Toy Group has launched Tracy Island as part of its Thunderbirds toy range, and past years have seen the play set win both the coveted Toy of the Year accolade and the Pimpernel Award for the most elusive Christmas toy. 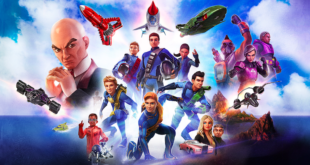 Vivid’s all-new interactive Tracy Island ties-in with ITV Studios and Pukkeko Pictures’ reinvention of the classic TV series, Thunderbirds Are Go, designed to bring the Tracy brothers’ HQ to life for a new generation of Thunderbirds fans.